Yesterday my friends Sean & Michelle came over to make a batch of cheese. We settled on Colby, as it fit our time requirements and the ingredients we had on hand. 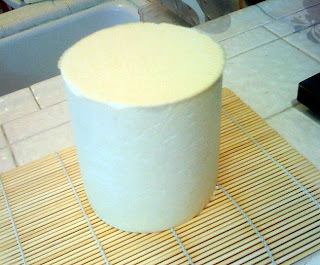 The big difference between Colby and some of the other cheeses I've made is that Colby is a "washed curd" cheese. After cooking the curds, we drained off most of the whey (saving it for Ricotta, of course) and then replaced the whey with fresh 60-degree water. Not only does that lower the temperature of the curds (changing the moisture content of the final cheese--colder than 80 is moister, warmer is drier), but it also washes the milk sugar (lactose) from the curd and helps avoid making the cheese sour. This is also my first attempt with cheese coloring. So far, it doesn't seem like it's done much... I'm wondering if the color will become more pronounced as it ages? (Though it does look like there's a very faint splotchiness to it, which actually seems like a traditional colby coloring). Time will tell, eh? 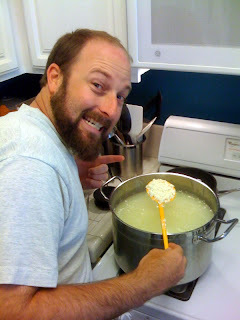 Here's Sean, stirring the curds! 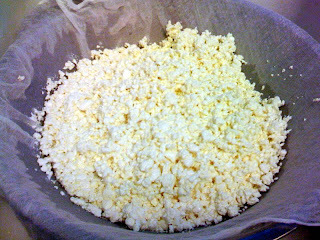 And here are the curds after washing and draining. We then salted them and put them in the press. Even though we pressed it at increasing pressure (flipping between pressure changes), the cheese came out a bit lopsided. Thankfully that won't affect the flavor!